Finally, an update about the quilt-along! I’ve been slacking about a new DS post because I’ve been too ashamed that I’ve hardly been working on mine. As of this afternoon though, I have my “Flock of Triangles” top completely pieced. It’s really tiny–I had intended on it being a baby gift, but after I started assembling it, I decided I wanted it to be a wall hanging in my sewing room (that’s not such a bad thing, is it?). For being such a small project, at times it really was a big headache. The first thing I missed was that I should have cut the triangles to not stretch (normally I like ignoring bias rules because I feel like it gives the quilts a more unique look that I tend to like). My rows were off in a couple of spots, but since they also had the stretch, it wasn’t a problem to squeek an extra bit of length into them. My other problem seemed to be not sewing off the tips of the triangles. It was a little hard to make things straight, but I just figured that I’d go with it, tips missing and all. And from what I’ve heard and seen from everyone participating, things seem to be going really well! As Christmas presents, Angela made just about everyone she knew a potholder. Seriously, she made SEVENTEEN of them. She’s by far the winner of most DS projects completed! Jenne also made an awsome potholder with the cutest red and white polka dot fabric on it. I loved it! Stephanie has set to work on “What a Bunch of Squares.” It’s really off to a good start. Jessica has taken on two projects at once. She’s working on ““Big Zig” and “One Tote Fits All.” Not only are they turning out great, but she’ll probably get tips from Denyse during her quilting class that she’s taking in Connecticut through Make Workshop! How exciting for her! I’ll share more news as it comes–we have a few new additions to the quilt-along so hopefully we’ll be seeing great things from them too! again. Everyone who wants to participate is totally invited to join at any time! I have finally made some progress with a project for the Denyse Schmidt Quilt-Along! I’m working on a crib size “Flock of Triangles” to give as a gift later this winter. I know the picture is really bad, but as soon as I had all the pieces in a good spot, I had to snap a shot of it. I wasn’t real excited about doing a light blue and white quilt, but it’s actually pretty nice. If it were for me, than I think I would have chosen some more interesting colors. I’m just glad that I’m finally getting started on a quilt from the book! I’m so excited to see what people have done so far. All of your projects are coming (or have already come) along so well. We’re making some great pieces from this book! Denyse Schmidt Quilt-Alongers, I haven’t forgotten you! It seems like progress for some of the people who have already started their quilts has been a little slow, but I really can relate lately. Of those coasters I mentioned last time I posted, I have ONE finished. I do love the first one though! I think the set will be very cute when I get it finished. Not everyone is as pokey as me though. Allison (also a friend of mine who comes to my sewing group!) has finished her Zigzag Bag! I really like the projects from the book that include vinyl, but since I don’t have a Teflon foot yet, I haven’t tried any of them. Allison said she used her walking foot to sew the vinyl for her bag, and it worked just fine. Also to mention, Cassie and Karen have joined the quilt-along. New Quilt-Alongers are always welcome! I’ve been debating for about a week on which quilt pattern I’m going to do for the Denyse Schmidt quilt-along, and I really can’t decide. I’ve decided to start small. The first project from the book that I’m going to do is the Mix-It-Up Cocktail Coasters. I’m pretty sure that I’m going to end up making one of the quilts for my friend Kate, but she won’t be able to pick which one she wants me to do until she visits me in September. So for the time being, I’m going to start with small projects! I’d also like to try some of the Dis-cards and the Step Lively Slippers. I see good ideas for Christmas presents here! So far, both Chawne and Jessica have decided to do Drunk Love 2-Tone. Jessica has hit up Hancock’s of Paducah for their Kona solids, after Denyse left some advice on her blog about where to find a wide variety of solid fabric. If you’re planning on using solids in your projects, they’re a great bargain and they come in every color possible. I’m off to make my coasters! Denyse Schmidt Quilt-Along Kick Off! I’m officially starting up the Denyse Schmidt Quilt Along! Like I mentioned before, the plan is to pick either a quilt or a project (you can do more than one if you want!) 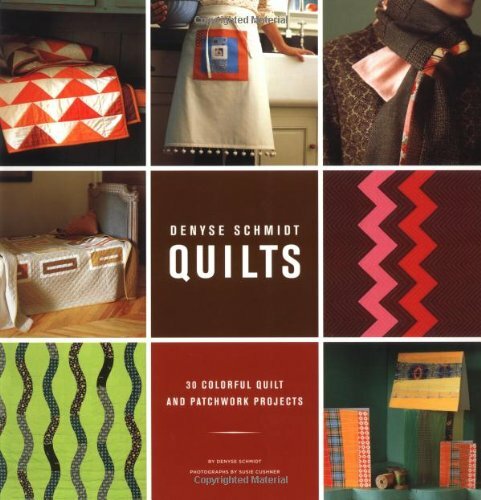 from the new Denyse Schmidt Quilts: 30 Colorful Quilt and Patchwork Paterns book. I’ll be writing about the quilt-along at least once a week to keep everyone up to date on other quilter’s progress, too. If you want, take a button with you, and link it to this page. When you get started, you might want to take some time to read the section about color and fabrics in the beginning of the book. If you’re planning to make a quilt or project similar in style to the Denyse Schmidt Quilts, she suggests using 70 percent solid color fabrics and 30 percent prints. She says that it’s okay to not worry about color combination rules, and to chose combinations that give you an emotional response instead. If that overwhelms you, another suggestion is to put possible fabric choices in a paper bag, shake it up, and pull out random pieces to use! Remember, even if you don’t have a lot of sewing experince, you can still try your hand at smaller projects from the book. There’s no due date, so don’t feel like you can’t join in, even if you don’t have the time to start right away. Just leave me a comment or an email and I’ll add you to the list! Happy Quilt-Alonging! UPDATE! I’ve added links to everyone who has contacted me to participate in the Quilt-Along so far. If you don’t see your name there, I’m sorry! Just leave me a quick comment or e-mail and I’ll get you added to the list. I’ve also put folks who told me they were tentatively interested in joining in earlier. If you aren’t interested in doing it anymore, let me know and I’ll take your name down. But remember, nothing is due, so you have no pressure to make something right away!